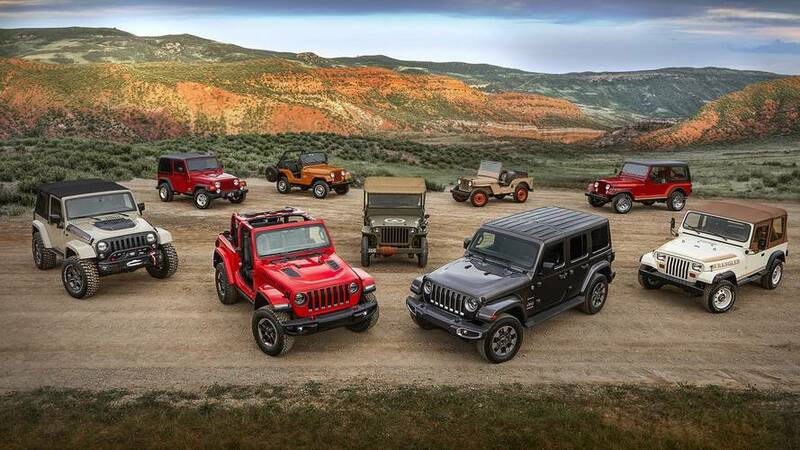 A revamped Jeep Wrangler has been in the works for some time now, and we’re expecting to get full disclosure in just a few months at the 2017 Los Angeles Auto Show. Aside from a partial side shot we got of a fully exposed Jeep from JLWranglerForums awhile back, we’ve only seen the new off-roader wrapped in black camo on both front and back. Now, that camo is all but stripped away, giving us our best overall view of the new Jeep we’ve had thus far. To nobody’s surprise, the new Jeep is very much like the familiar outgoing model, though it does have a slightly less upright look about it. Credit that to various styling tweaks, among which are a fixed windshield with a bit more rake angle and front clip that appears to be a bit longer. Even the rear tail lights – which themselves are slightly redesigned to be a bit more square than rectangular – help give the new Jeep better horizontal proportions. There is still some covering visible up front on the grille and around the headlamps, but we can easily see the design changes that include what look like LED running lamps integrated into the fenders. The new Jeep will likely have a considerable infusion of aluminum to keep weight down, though it’s said to also wield plenty of steel as well. Under the skin, we’re still expecting the Pentastar V6 and eight-speed automatic as the main powertrain option, though a 2.0-liter turbocharged four-cylinder named Hurricane will be a new fuel efficient option. A 3.0-liter turbocharged V6 diesel is also expected to enter the scene, along with a possible hybrid powertrain.